Most of us have a love for new clothes – we keep buying all sorts of clothes in different colors and designs to add to our wardrobe. More often than not, our closet gets over-stuffed and cluttered and it becomes a nightmare to locate a particular garment at a short notice. The other day my friend Reena came very late to a party. The reason? She couldn’t find the matching blouse for the sari she had planned to wear. Here are a few tips you may find useful in order to organize your closet. Organize your clothes by season : silk shirts and thick suits for winter, nylons and synthetics for the monsoon, crisp cottons, wispy chiffons and georgettes for summer. If possible, pack away the season’s clothes once it is over, and take out the next set.. I feel it looks very silly to wear heavy silks in the peak of summer and feel hot and sweaty, or to wear a wispy chiffon in freezing weather. Categorizing clothes by season also ensures that the clothes remain in good condition and are not over-used. Also, when you take them out after a year, they feel fresh and ‘new’. It is also a good idea to organize your clothes into school/college wear, casual wear, party wear and daily wear. That way you don’t have to look all over the closet for an outfit to wear to your friend’s birthday party the next day. You can keep all your party clothes in say the top shelf, school/college wear in the middle area (which is easily accessible) and casual and daily wear in the bottom shelf. Image consultants state that more often than not, we tend to grab what is on the top of the pile of clothes in our cupboard regardless of whether we have worn it just a couple of days ago. To get organized, review your wardrobe space first and then get down to the job. While buying clothes, think of how they can be mixed and matched to give a new look. A black/cream/white jeans/trousers can be teamed with a number of different tee shirts/tops. Trousers and tops can be mixed and matched in a number of ways. For those who wear skirts, a black and a white one are a must. Buy clothes which are versatile and you will have an enviable wardrobe. While some clothes may go out of fashion, there are a few timeless classics that are indispensable for any wardrobe. They never go out of fashion or look back dated, and always look right. These include a black skirt, jeans (for casual wear), well-fitting black/beige trousers (for formal wear), fitted shirts in white and camel, jackets, cotton churidaar-kameez sets and of course a number of tee shirts etc. A couple of jeans and a leather jacket can also be included in this list. Its no use having a closet stuffed with old clothes which you no longer wear – either because they don’t fit or because they are no longer in fashion. Anything which is hopelessly out of style deserves a decent retirement. It’s a good idea to give away old clothes to charity, to the local orphanage or even to your maid (if she will use them). That way you will create more space in your closet for new buys. Some clothes which no longer fit can do with a little alteration.. Long kurtas can be shortened, sleeved outfits can be made sleeveless, a plain can be livened up with a border or appliquéd motifs, a neckline can be changed – the options are endless. Your clothes will last longer if you take good care of them. Once you wear an ensemble, before putting it back in your closet, see if it needs to be washed or dry-cleaned, ironed or mended. It is extremely irritating to find that the garment one has planned to wear needs ironing, or has a button missing. The clothes you put back in the closet should be ready to wear off the rack. Keep a ‘darning box’ handy containing hooks, buttons, needle, colored threads and a pair of small scissors to do minor repair jobs. Put perfumed sachets or pot pourri in your closet so that your clothes smell fragrant. You can also put empty perfume bottles (with the stopper open) or soap-wrappers among your clothes. Woolen clothes should be stored with some naphthalene balls among them to ward off insects. Zari and zardosi garments can be lightly wrapped in white muslin cloth before storing. Change the folds of heavy saris once in a while to prevent them from tearing at the folds. How you arrange your clothes in your closet depends a lot on your lifestyle, tastes and personal preferences. Always hang your expensive clothes rather than fold them and hang jackets to avoid the perma-crease that occurs.. It is also advisable to take out the clothes you plan to wear the next day and hang them for a while to minimize creases. If your closet is big enough, it can also house your accessories – shoes, belts and handbags. You can hang the belts on the side rod of the wardrobe. Most closets also have space for handbags. ‘Party’ handbags can be wrapped individually in transparent plastic bags and kept separately. Shoes can be placed in a shoe rack or in a box. Before putting away your footwear, check if they need to be cleaned, polished or repaired. Party shoes can be kept in individual boxes. It is a good idea to rotate your daily footwear, rather then wear the same pair every day. Invest in good quality hangers for your clothes. 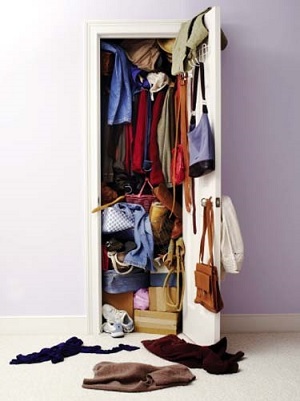 Make it a point to tidy up your closet at least once a month. Keep it well-organized so that you can get ready at a short notice. Keep a traveling suit and kit ready in case you have to travel at short notice. Don’t stuff your closet with towels, linen, lingerie and other things – find other places to store them. A recent research says that 58% of people base their first impressions about you on the way you look. The visual image of you is the first image people have before you even say a word. No doubt clothes are an important part of our life. A little bit of planning and patience will go a long way in organizing your closet and make life easier for you.